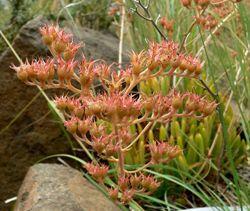 Dudleya viscida is a rare succulent plant known by the common name Sticky Liveforever. This dudleya is endemic to southern California, where it is known only in San Diego, Orange, and Riverside Counties. It is mainly found on coastal bluffs and inland chaparral rocky slopes. A basal clump of erect fleshy, pointed leaves which are nearly cylindrical. They are pale green to yellow-green or red in color and covered in a sticky, oily exudation which has a faintly resinous scent. White flowers with red margins appear from May through June. Great for containers or rock gardens. Very drought tolerant.